LG kicked off the busiest day for CES 2017 announcements by revealing its latest OLED TV. 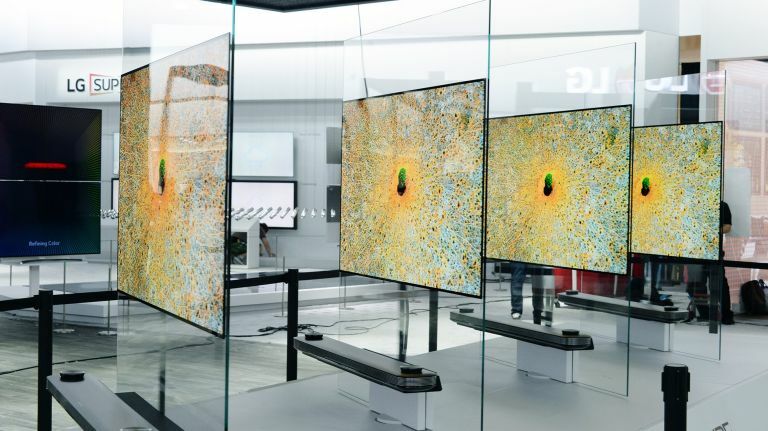 While Samsung and Panasonic concentrated on colour reproduction with their new OLED announcements, LG preferred to let thickness and features do the talking. LG's new 4K HDR OLED TV is just 2.57mm thick and, what’s more, there’s Dolby Vision and Dolby Atmos built-in. The new W7 comes in both 65-inch and 77-inch sizes and is designed to look like a ‘picture on the wall’ rather than a TV thanks to the same super thin design we previously saw with the B7 and C7 series LG TVs. As in LG's older OLEDs, the W7 also features pixel dimming tech to render blacks with a limitless contrast ratio but tthe new model also has an expanded color gamut. If you want to mount it on the wall you'll be using magnets to do so - this ensures there's no gap between the TV and the wall. The HDR tech in these sets has been dubbed 'Active HDR' by LG, as the TVs process the picture frame by frame, enabling the TV to offer the best picture even if the original HDR content contains static or no metadata at all. And all of LG’s 2017 OLED TVs all HDR formats - Dolby Vision, HDR10, HLG (Hybrid Log Gamma) and are Advanced HDR by Technicolor ready. A new HDR Effect feature which processes standard definition content frame-by-frame to improve contrast ratios and brightness in specific areas. All LG’s 2017 OLED TVs will support Dolby Vision and Dolby Atmos globally, including the 77/65W7, 77/65G7, 65/55E7, 65/55C7, and 65/55B7. In addition to this combined experience, all LG’s flagship Super UHD TVs will continue to support Dolby Vision in 2017. This includes LG 2017 SJ9500, SJ8500, and JS800 Super UHD TVs available globally. The W7 OLED TV series builds on LG OLED’s revolutionary pixel dimming control technology, which renders perfect black without any light leakage to with one billion possible colors. What’s more, all LG’s 2017 OLED TVs use ULTRA Luminance technology to deliver greater brightness where needed.